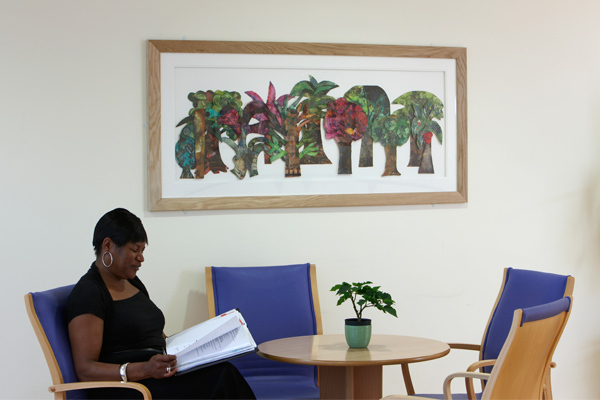 This participatory arts project for mental health service users at Callington Road Hospital, Bristol was developed by Willis Newson for Avon and Wiltshire Mental Health Partnership NHS Trust (AWP). It involved artist residencies, the creation of permanent artworks for the site and a showcase event. We also developed a model to allow ongoing, sustainable arts activities to take place across the wards after the end of the project. Resident artists led a series of sequential workshops for adults and older adults within the hospital. The final commissioned artworks included a booklet of poems, a CD and a series of vibrant felt collages now on permanent display. An evaluation of the project was carried out by researchers from the University of the West of England (UWE) working with Willis Newson. Find out more about the evaluation on the UWE site. Download a case study for this project.